← Risk / tolerance approach in return to play decision making – the right approach? In our view, looking at intra-compartment pressure for the diagnosis of chronic exertional compartment syndrome (CECS) without visualising a pressure tracing is like trying to interpret an ECG without the ECG tracing. How do you know what is wrong with the cardiac muscle? We are not for one minute suggesting that the two conditions are the same, but would like to put forward an argument for intra-compartmental pressure (ICP) testing using a pressure tracing as a very useful and more objective tool in making a diagnosis of CECS. Fig.1. Squeezing the compartment being investigated causes a deflection, thus confirming correct placement of the catheter and ensuring its patency. Fig.2. Dynamic ICP of 4 compartments showing on-line pressure tracing from which maximum, mean, relaxation and resting pressures can be calculated. (3) It can detect blockage at tip of the catheter, from wave form changes. 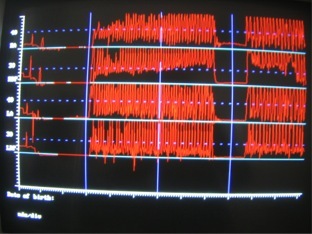 (4) It can detect whether the catheter has slipped and sitting under the skin, from wave form changes. 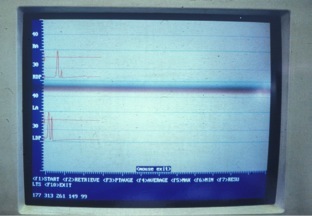 (5) It can detect whether it is part or fully in the blood vessel, from wave form changes. Fig.3. 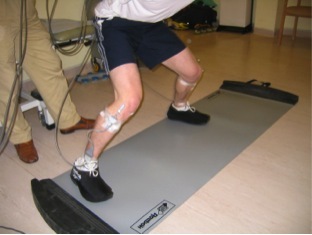 A Skater being tested on a training mat, activity that brought on his symptoms of CECS. His pressures between jogging on the spot and skating were vastly different in dimension and wave form. I have chronic leg compartment syndrome which i find very frustrating.I have had to cut out most of my endurance work like runing etc.I have been experiencing other none related problems :- right foot digits and fleshy area directly below,. numbness,pins and needles and most recently dark purple bruising on and around ball of foot. I am awaiting further investication.